The Royal Bardia National Park, situated in the mid-far Western region, is the largest and most unspoiled wilderness area in the Terai, covering an area of 968 sq.km. The park, a sub-tropical jungle, is thickly forested by sal trees and carpeted with grass, savannah and riverine vegetation. The north is bordered by the Churia hill range, the west by the Karnali river, while the Babai river cuts its course almost through the middle of the park. 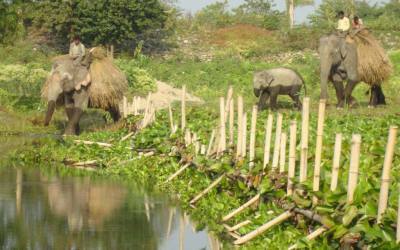 On the southern fringe of the park are the villages of the unique and indigenous Tharu people of Western Nepal. Considered as one of the most picturesque national parks in Asia, it teems with rich and diverse flora and fauna. The park is home to more than 30 different mammals, including the langur and rhesus monkeys, civets, hyenas, wild dogs, sloth bears, otters, blue bulls, deer and wild boars. It is a regenerated habitat for endangered animals like the tiger, rhinoceros, wild elephant ( the park harbours the biggest wild tusker in Asia) and black buck, Gharial and marsh mugger crocodiles the great game fish-masher and the Gangetic dolphin cavort in the river waters. The unique birds which number over 350 species include cormorants, egret, storks, geese, jungle fowls, king-fishers and endangered species such as the Bengal florican, silver-eared mesia and the saurus crane thus making the park truly a bird watchers paradise. 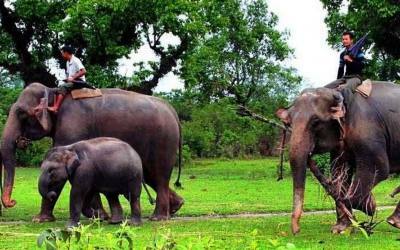 Royal Bardia National Park (810 20’ E and 280 35’ N) is the largest lowland protected area of Nepal. The park is located in the western lowland and encompasses a total area of 968 km2. The park includes alluvial floodplains created by Karnali River in the west and pristine ecosystem of Bardia valley in the northeastern section of the park. In 1967, part of the area was established as Royal Hunting Reserve. Later in 1976, the area was gazetted as Royal Karnali Wildlife Reserve to include an area of 386 sq km and renamed as the Royal Bardia Wildlife Reserve (RBWR) in 1982. Before the establishment of hunting reserve the villages located in Baghaura Phanta and Lamkoili Phanta were relocated outside the reserve boundary. In 1984, the area was extended in the east to include the Babai Valley to encompass a total area of 968 km2. 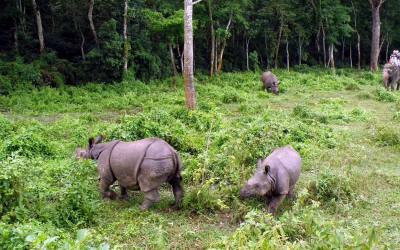 In 1988, the whole area was declared as Royal Bardia National Park (RBNP). Recently the proposed extension of the park in the east in Banke district has been dedicated as a "Gift to the Earth" and declaration is in process. The park is reputed for its rich biodiversity. The vegetation in the park ranges from early successional stage, tall floodplains grassland, established on the alluvial floodplain of Karnali, Orai and Babai river systems to the climax stage, sal (Shorea robusta) forest, extended on relatively dry flat lands and slopes of the park are revegetated and are dominated by grass species. The faunal diversity of the park includes 53 species of mammals including endangered megaherbivores like rhinoceros (Rhinoceros unicornis) and elephant (Elephas maximus), more then 25 species of reptiles, over 400 species of birds, 121 species of fishes and unknown diversity of mollusks and arthropods. Species conservation in the park has yielded satisfactory results as a number of mammalian species such as tiger, elephant, spotted deer, hog deer, smabar deer, swamp deer etc. have made remarkable comeback. 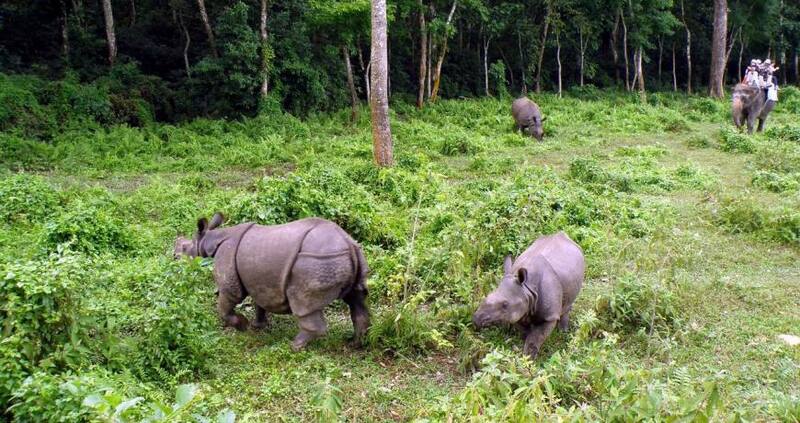 In this regard, reintroduction program of endangered rhinoceros has been carried out regularly since 1986. So far a total of 58 rhinoceros have been released in two different sites (Karnali floodplain and Babai valley) of the park. The current population of rhinoceros has been estimated at 73. Restriction in the traditional use of nature resources inside the park, damage to agricultural crops, local harassment and livestock depredation by the park animals have created conflict between the park and people residing in the buffer zone. To overcome these problems, a wide range of initiatives has been instigated for the past few years. Allowing local communities to collect thatch grass inside the park and declaration of buffer zone regulation are among the major steps taken in this regard. Beside, a Rahat Kosh (relief fund) has also been created to compensate injuries and loss of life, livestock depredation and property (mainly house) damages caused by wild animals. Furthermore, RBNP in direct collaboration with four major projects has been launching a number integrated conservation and development programs targeted to build up harmonious relationship between park and people as well as to motivate buffer zone communities towards the conservation of the park bio-diversity. For the better protection and management of the park, HMG has developed 132 park staff, 2 companies of Royal Nepal Army and 10 elephants and their drivers (35 persons). Similarly, a wide range of interventions has also been made to manage park’s bio-diversity. Habitat management is among the major initiatives taken to improve the foraging grounds for large and medium sized mammals. On your arrival at Nepalgunj Airport or Ambasa Stand. Our staff will receive you. You will then be transferred to our Lodge where you will be offered refreshment & be given a briefing on your lodge & its facilities. After being given your programmers for the day, your room will then be allocated to you..
07.30 Elephant Safari. An excellent opportunity to see Asian Elephant, Great One Horn Rhinoceros, Spotted Deer or Chital, Hog Deer, Barking Deer, Samber, Swamp Deer or Barasingha, Nilgai or Bull, Black Buck, Wild Boar, Royal Bengal Tiger, Leopard, Wild Dog, Golden Jackal, Striped Hyena, You will also encounter many other smaller mammals that have made Bardia their home. Visitor Center, Crocodile Breeding Center & Tharu Cultural Museum. 15.00 Jungle Walk. An excellent opportunity to see the wild animals, small mammals, birds and waits in the Tower (Machan) to have the wild sightseeing, accompanied by our experienced naturalists and wild life tracker. Excellent photographic opportunities are plentiful.